Note: Have you tried to have a serious conversation about the problems that you have with the job? Have you gone up the chain of command to give them a chance to straighten the issues out? I am going to give you some advise on how to quit your job. This is important because if you don't think this out before hand it could really hurt you in the end. A lot of people let their poor experience at the job cause them to interact with a lot of negativity at the end of their employment with the company, this tends to work against you. Before we even get into that part of the process,let's entertain the thoughts behind you thinking about quitting in the first place, then we will get into the advise about how to quit your job. The reason I want to do this is because you don't want to establish a history of jumping from job to job because it will work against you. should you quit in the first place? 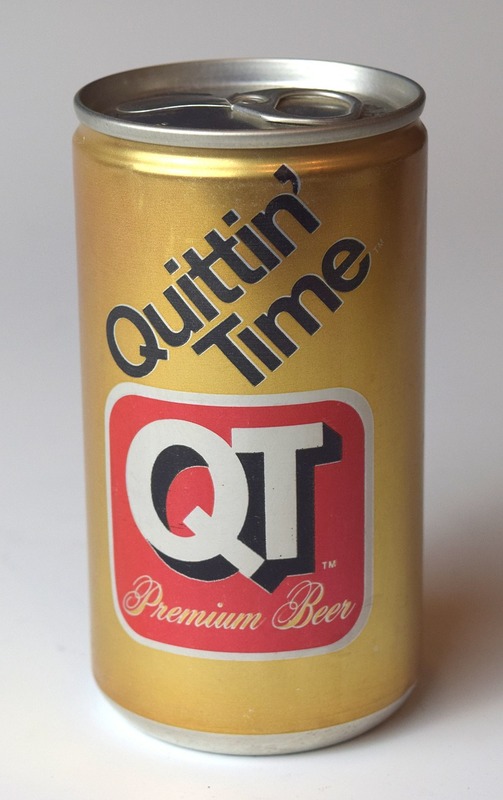 Quitting is more serious than most people realize. You are smart to be reading about it before hand meaning you DO realize there is often collateral damage involved. Because of this, I want you to entertain these thoughts prior to deciding if you will follow through with quitting. What are your desires in a company? Why are you working where you are working? Have you asked other drivers at your company if they are experiencing the same type of issues that you are at the company? Have you asked other drivers/employees at other companies if they experience the same types of problems at their jobs as you have at yours? Have you tried changing your attitude to see if things will get better? Is you job performance as it should be? If not doing better might improve the situation. Is pay the only thing that is causing you to consider quitting? Have you compared not only salary but also the benefits at the company that you are considering? 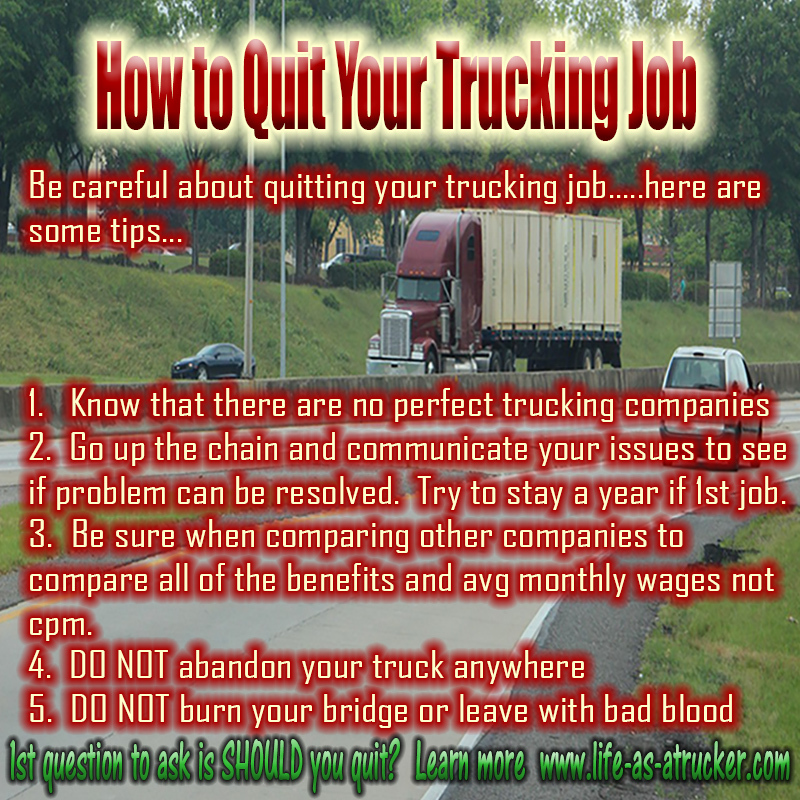 So, if you have entertained these thoughts and you want to quit still here is some advice about quitting your trucking job below. First and foremost though....Do not quit until you are back at your home terminal. Especially if you are having issues with your dispatcher where you don't get along well. If you do get along well, give a notice that you want to quit 3 weeks in advance 2 weeks minimum. Ask, him/her to route you in to the terminal in time to be back on the day that you want to turn in your keys, etc. This courtesy and thoughtfulness will help you have a good referral from the company when you are applying at other jobs. Have a nasty attitude and increase your chances of having negative marks against your work performance. Leaving the truck parked somewhere unauthorized will cause you to face one of the most negative charges against your driving history. It's called abandonment and it will get you black balled by the trucking industry. It could also get your last checks withheld for expenses of getting their equipment back. If you leave a loaded truck somewhere the consequences could be even worse. Do not leave the truck parked anywhere other than the home terminal or where they tell you to take it to. Do not to trash the truck or abuse equipment or talk about the company to shipper/receiver just because you are quitting even if the company is not good to you or what you expect. Stay positive and upbeat about the entire situation. After all you have thought through this and decided it is the best move for you. Why allow anything about it to cause you stress. Focus on your next best moves. What questions do you need to ask and to who to find out if you will encounter the same types of situations at the next company you work for? What have you learned from this ordeal that you can use in your next steps? No need to waste time focusing on the negative aspects of this situation you are leaving, instead focus on the positive outcome of your next move because of the lessons that you have learned and will benefit from by the knowledge that you carry forward. Life is exciting! These are some common reasons that people may be thinking about quitting their trucking job. These types of things ca easily be an unreasonable expectation. Reason being either it is a normal part of trucking or there are things that can be done to help change the situation prior to quitting. If any of these common reason seem foreign to you then I think you might need to go back and read this page again. Can I be charged with abandonment of a load if I drop a loaded trailer on their yard, and then quit. if i quit my trucking job and didnt take the truck back does that look bad? My buddy is quitting his company and they refuse to route him to the terminal to turn his truck in. What are his options?